If a full day of partying like it's 1879 isn't good enough for you on this Presidents' Day, stores across the country have found an excuse to offer SALES. One of those stores is TylerTool.com, and how can we pass up a good deal? 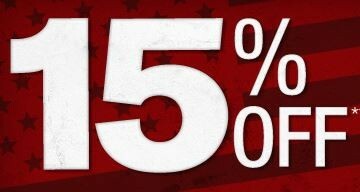 Until the end of today Tyler Tool is having a 15% Off sale in honor of our dear and sometimes jeered Presidents. Coupon code pres15 will grant you the sale price for New tools priced over $100 from select brands. Sale brands include Bosch, Bostitch, DeWALT, Hitachi, Senco, Makita, Milwaukee and more. Tyler Tool does a good job of keeping their prices low, so this 15% off coupon code does actually make for some really good prices. Also remember that orders over $199 will get you free shipping; it will be $6.99 otherwise, which still is quite good. In the cart the coupon code says that it is eligible on orders of $100 or more, but it does not say this anywhere in the sales fine print. I bring this up because I can see it working on items well below $100.